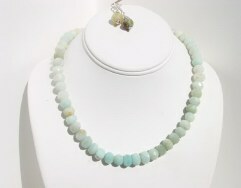 A cascade of brilliant, gleaming Amazonite beads that beautifully accentuates the curves of your neck. Earrings. Creative Bead Designs create unique one-of-a-kind handcrafted beaded jewelry, concentrating on semiprecious stones and pearls, combining both traditional and contemporary materials and jewelry making techniques.All Rights Reserved.